An MTS Model 311.31 multi-actuator servo-hydraulic testing machine utilizes a 110 kip and 220 kip actuator to enable testing at strain rates ranging from 0.001/sec to 500/sec. The 110 kip actuator is powered by five nitrogen accumulators that can accelerate the 110 kip actuator from a stationary position to 120”/sec over a span of 1”. Both single sequence and multiple sequence compressive events are possible with this apparatus in the evaluation of the effects of changes in strain rate on flow behavior of a wide range of materials. This information is relevant to metal forming/forging, crash and crush resistance of materials, as well as blast events. The 220 kip actuator is powered by normal servo-hydraulic pumps and is capable of a maximum speed of 1”/sec. This machine is also utilized as an Advanced Deformation Simulator and Forging Simulator, as described below in the ADVANCED MANUFACTURING SECTION. 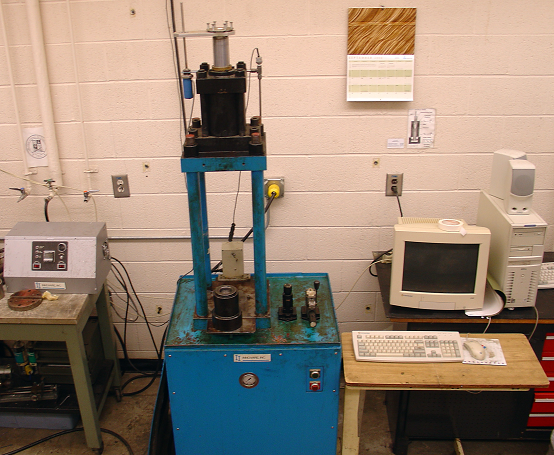 Tension testing with superimposed hydrostatic pressure can be conducted on either a gas-based or oil-based system. The gas-based system utilizes a multi-walled pressure vessel that accommodates a test capsule that includes the sample to be tested, an internal load cell, and internal pressure diagnostics. The pressure vessel is filled with Ar gas and then intensified to constant levels of pressure up to 700 MPa (i.e. approximately 100 ksi). This system is linked to a 110 kip MTS servo-hydraulic actuator that is controlled with an MTS 458 controller. The system is operated remote and enables tension testing with a constant level of confining pressure. The oil-based pressure system (Innovare, Inc.) utilizes silicone (or other oils) that can be simply compressed via pushing a plunger into a pressure vessel that contains fixturing to enable tension testing at different levels of hydrostatic pressure. A variety of different pressure vessels are available with the maximum pressure level attainable approaching 2 GPa (i.e. 300 ksi). Internal load cells are used to monitor the pressure in the chamber as well as the load on the sample. The oil can be heated to enable tension testing with pressure at temperatures up to 300C. This unit can also be used to perform hydrostatic compaction as described in the ADVANCED MANUFACTURING SECTION. Mohsen Seifi, doctoral researcher in the Department of Materials Science and Engineering, has been awarded one of three 2014 American Society for Testing and Materials International Graduate Scholarships. Janet Gbur, a fourth-year PhD student in the Department of Materials Science and Engineering, placed first in the Student Presentation Competition sponsored by the ASTM Committee E08 on Fatigue and Fracture held during ASTM Committee Week in New Orleans, Louisiana in November. Members of the Graduate Materials Society took a moment to interact with alumni and faculty at the Case Alumni Association reception during MS&T in Pittsburgh, Pennsylvania.